Our technology solutions enable facilitation of integrated, multi channel communications including web, email, mobile, contact center and off line. We optimize the content of individual channels to maximize effectiveness. Seamless multichannel engagement with manufacturers, providers and consumers. 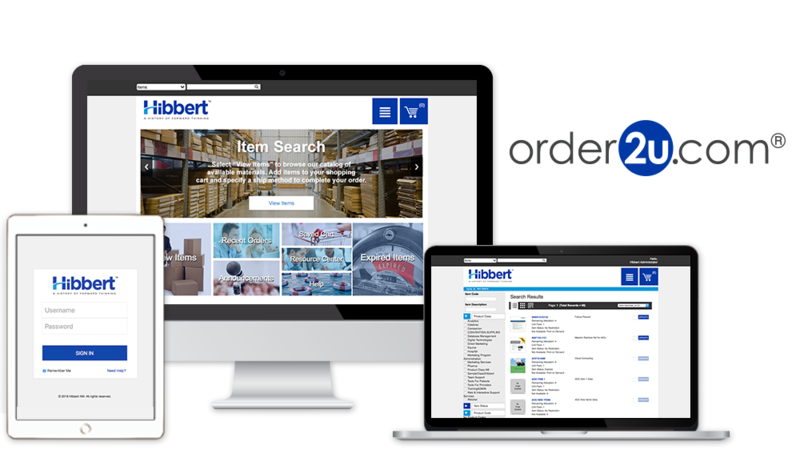 order2u.com® is a responsively designed platform that easily enables you, your sales reps, and home office to search for content, order materials, create custom resources, and access information on new/featured items. Multiple levels of security are available employing user’s login credentials to determine site access, searching/ordering privileges, and reporting ability. order2u.com® is also available as a mobile app. With just a few taps, iPad users can quickly and efficiently order digital and physical assets, providing seamless integration with the web-based portal by using the same system interface. We use predictive insights to optimize channel effectiveness. We measure performance and provide recommendations, and feedback that enable a brand to make actionable targeting and tactical campaign decisions. Campaigns begin with measurable goals and objectives. We have experienced data analysts that continually evaluate the data to provide timely feedback to modify and tweak campaigns to achieve set goals and objectives. Our Multi-Channel Campaign Management engine, H360, allows you to reach and interact with potential customers through a variety of digital channels — email and mobile campaigns. Our Mobile Messaging services enable you to reach your clients anywhere at anytime. Whether you need simple, one-way messaging or interactive communication via MMS or SMS, we have a solution that fits your needs. We offer best in class email marketing services designed to optimize campaign effectiveness. We help you avoid unnecessary regulatory delays, manage complex, multi-channel programs and better understand the outcomes of your campaigns. We offer best in class email l marketing services designed to optimize campaign effectiveness. We help you avoid unnecessary regulatory delays, manage complex, multi-channel programs and better understand the outcomes of your campaigns. Our Mobile Messaging services enable you to reach your clients anywhere at anytime. Whether you need simple, one-way messaging or interactive communication via MMS or SMS, we have a solution that fits your needs. Our eLearning Management System (eLMS) enable a custom, interactive educational experience. The platform is used to validate and certify learning for Manufacturers, Providers and Consumers. Intuitive navigation simplifies and strengthens certification and compliance programs. You can track educational or training initiatives to business metrics with robust analytics. You’ll know who completed each course, when, and how well they did. We support a variety of in-house digital and offset print applications. For Print-on-Demand (POD) and Just-in-Time (JIT) jobs, we support short-run requests in order to provide the fastest possible time to market. We utilize a comprehensive digital print strategy to help you identify the appropriate print channel for the greatest costs savings. We review your inventory and distribution patterns to find which items can be deployed to a digital print environment. Hibbert employs multiple state-of-the-art Xerox iGen 4 Digital Print Systems, as well as additional high-speed laser print technology for all of your printing and finishing needs. We operate Digital Print & Finishing Centers in our New Jersey and Colorado locations. We optimize your digital content by leveraging best practices for your email and mobile messaging programs. This approach maximizes the effectiveness of your marketing strategies and the reach of every customer communication. We apply best practices that help you deploy a robust digital messaging program.